ePublishing Knowledge BaseePublishing Knowledge BaseePublishing Knowledge Base Creating and Managing EventsHow do I create a registration form for an event? To create a registration form for your free or paid event, create a product out of the event. Learn how to set up the event itself here: How do I create an Event? Customer-facing registration/event design will vary by website, but during the purchasing process, your customer will be asked to provide a main contact and attendee details. To access the list of attendees registered for your event, click on Attendance under Edit in your Event in the Event Manager. 1. 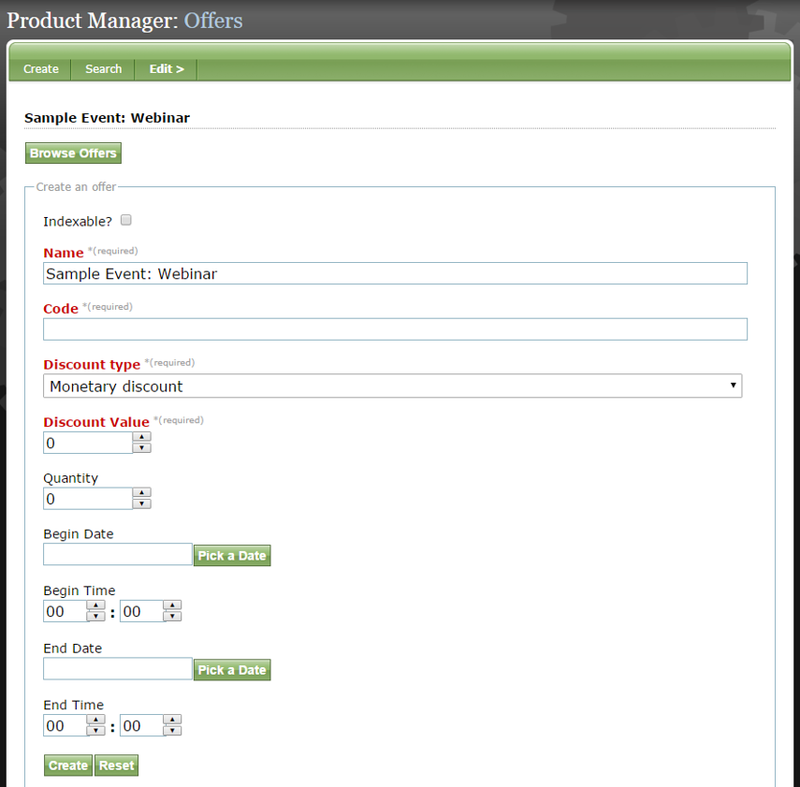 In your Event in the Event Manager, select Product under Edit. 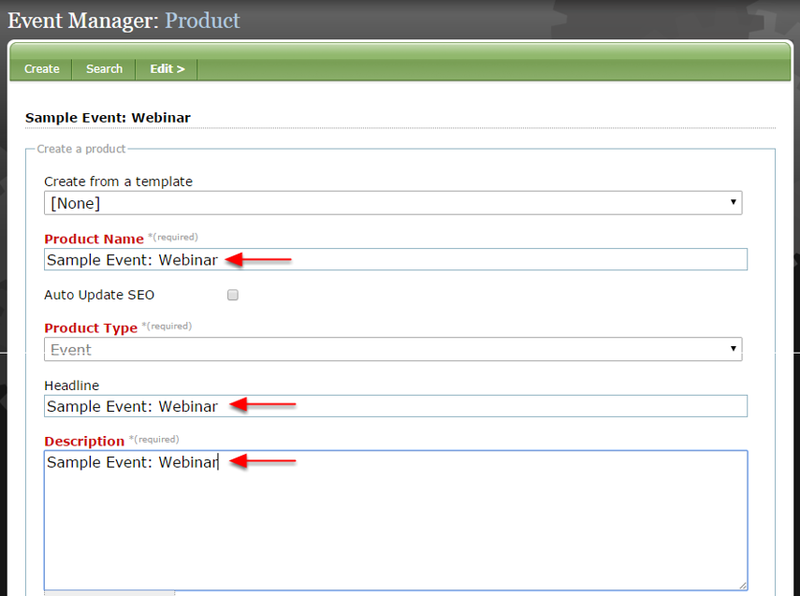 Zoom: In your Event in the Event Manager, select Product under Edit. 2. Add a Product Name, Headline and Description. Frequently, these are just the Event Name. Zoom: Add a Product Name, Headline and Description. Frequently, these are just the Event Name. Your Product Type will default to Event. 3. Set up pricing under Pricing Options. Zoom: Set up pricing under Pricing Options. 3.1. To set up registration for a free event, simply set the price as $0. Zoom: To set up registration for a free event, simply set the price as $0. 3.2. To set up pricing, set the minimum and maximum quantity (example: from 1-5 seats at the event) and the price associated with each. Zoom: To set up pricing, set the minimum and maximum quantity (example: from 1-5 seats at the event) and the price associated with each. 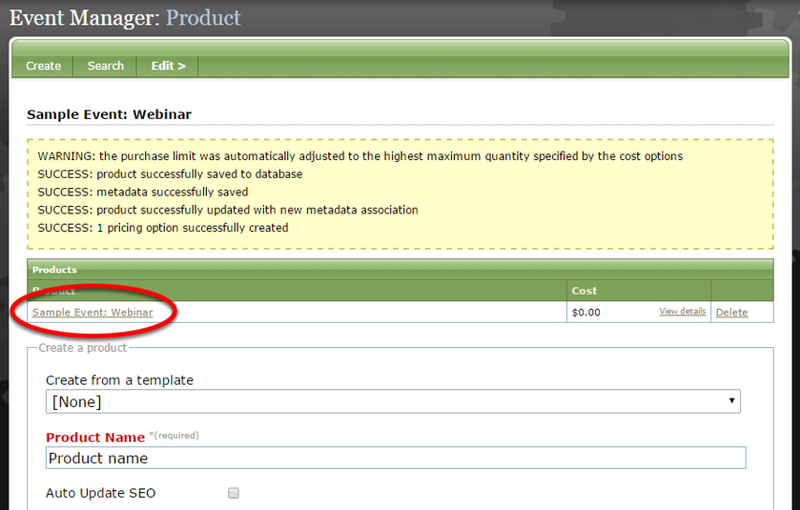 To add a pricing tier, fill in the form under the black bar labeled "Add more pricing options." For even more, click Add more (circled above). 3.3. To assign a Classification to your event - for example, Corporate Table - click Manage next to the word Classifications and click the box next to the appropriate taxonomy. 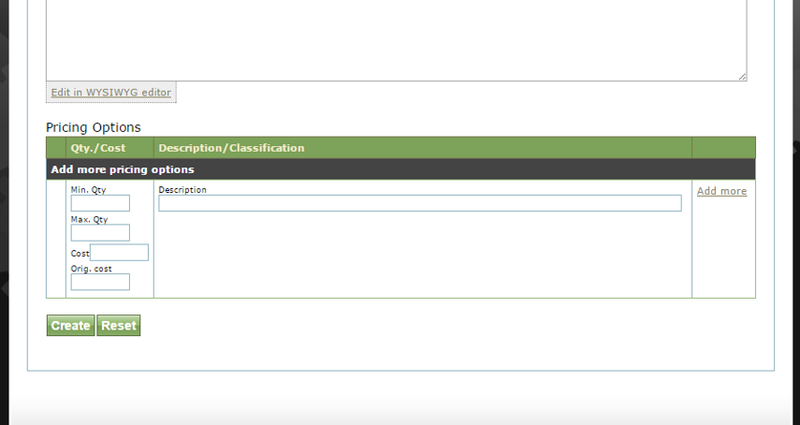 Zoom: To assign a Classification to your event - for example, Corporate Table - click Manage next to the word Classifications and click the box next to the appropriate taxonomy. 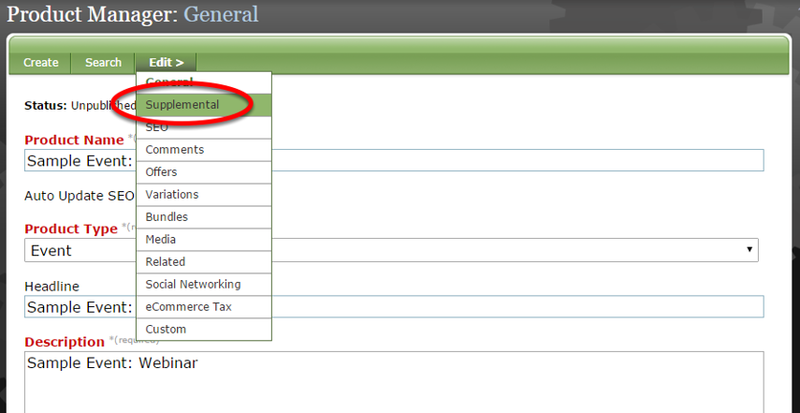 Classifications for Events are customized by website. For example, a Corporate Table classification would allow you to sell just 1 at the set price without affecting the bulk pricing set up for 1-5 seats at the table. 3.4. Here's an example of what pricing may look like for your event. 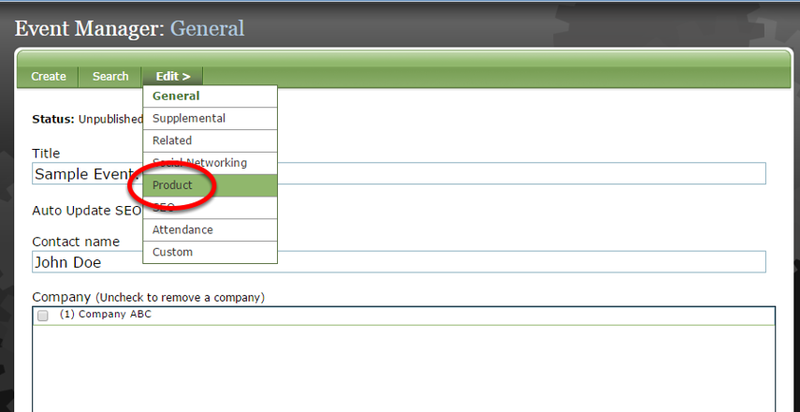 Classifications are customized by website. Contact your solutions manager for questions on classifications. Zoom: Here's an example of what pricing may look like for your event. 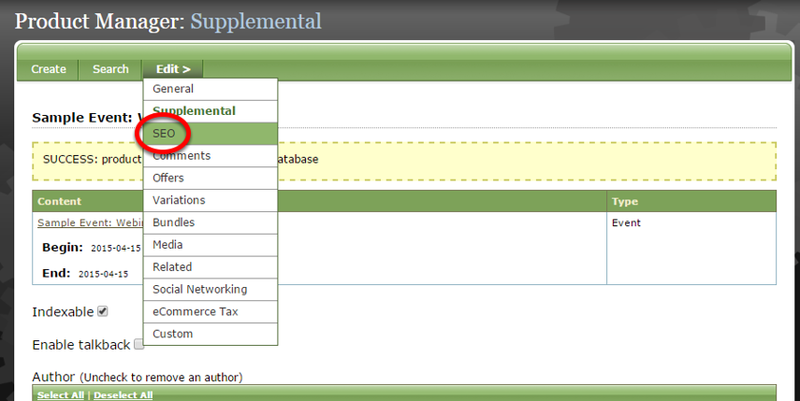 Classifications are customized by website. Contact your solutions manager for questions on classifications. 3.5. Click Create. To finish creating your product, click on the link that appears at the top of your screen. Zoom: Click Create. To finish creating your product, click on the link that appears at the top of your screen. 4. In your Event Product in the Product Manager, click Supplemental under Edit. 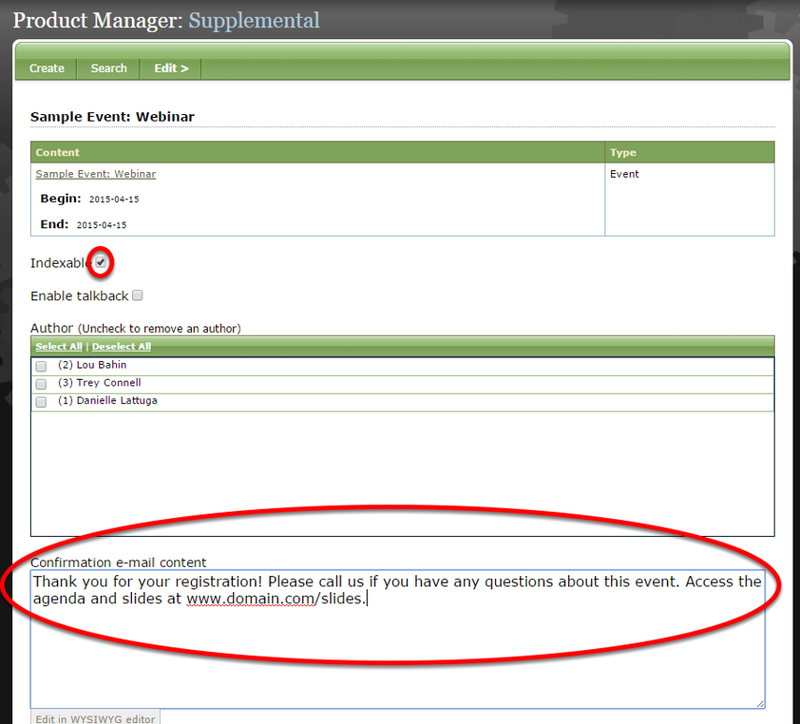 Zoom: In your Event Product in the Product Manager, click Supplemental under Edit. 5. Set your product as Indexable and add Confirmation Email Content. Zoom: Set your product as Indexable and add Confirmation Email Content. Indexable means that the product will appear in search results on your website when someone uses your website's search function. A confirmation email will be sent to your registrants/buyers immediately after purchase/registration. The confirmation email content provides you with an opportunity to customize the messaging they will receive. For an event, you may want to provide additional details or a URL where they can access slides, a full agenda or logistics details, for example. The content entered here will also appear in your online receipt after purchase/registration. 6. 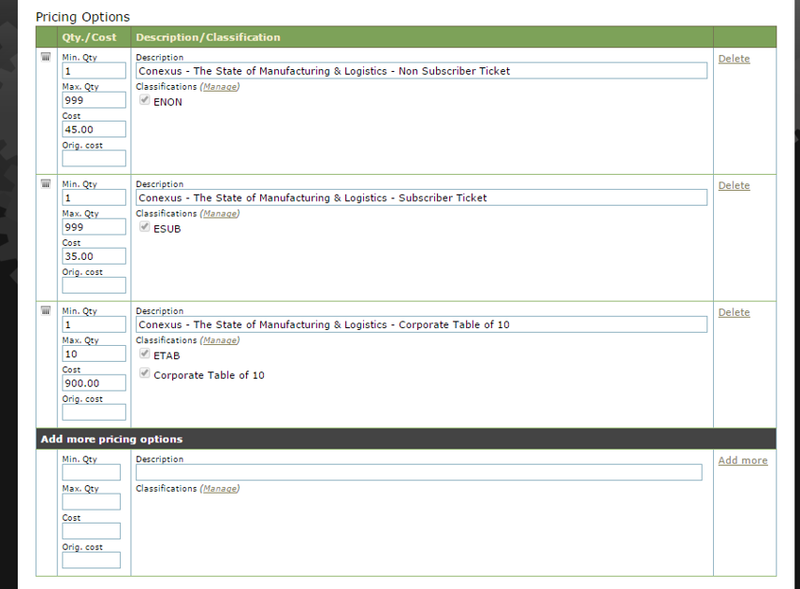 Assign additional Classification or Topic/Category, if desired, and click Save. 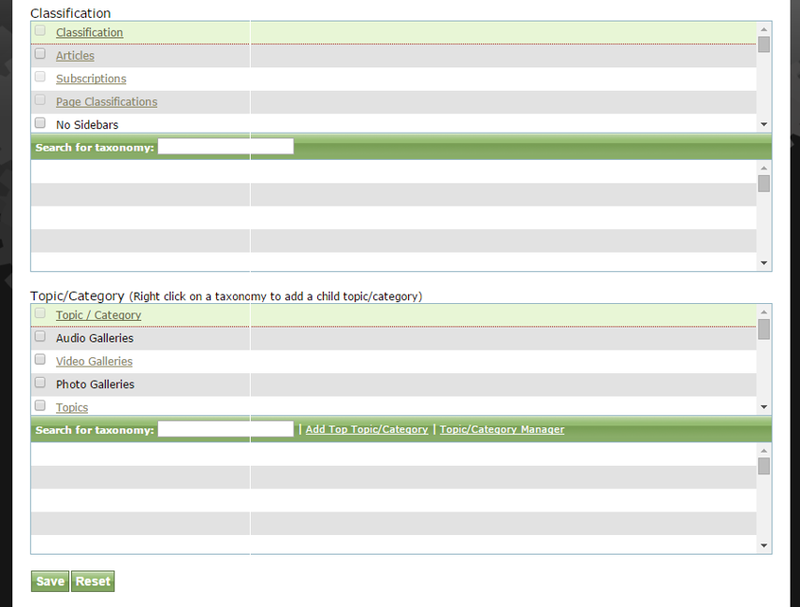 Zoom: Assign additional Classification or Topic/Category, if desired, and click Save. 7. 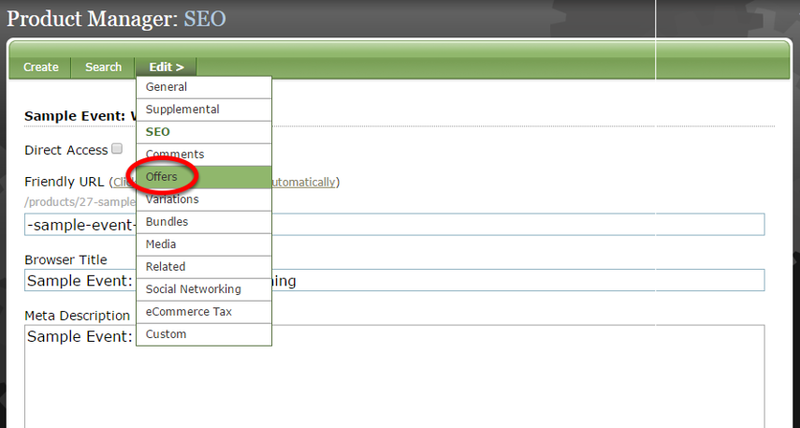 Update your SEO by clicking SEO under Edit. Zoom: Update your SEO by clicking SEO under Edit. 8. Be sure to update your Meta Description and Keywords, and click Save. Zoom: Be sure to update your Meta Description and Keywords, and click Save. 9. If you'd like to associate discount codes with your event, click Offers under Edit. Zoom: If you'd like to associate discount codes with your event, click Offers under Edit. 9.1. Associate your event with a current offer or set up a new offer. Zoom: Associate your event with a current offer or set up a new offer. Learn how to create offers in: How do I create discount codes or offers? 10. Your event registration is ready to go. 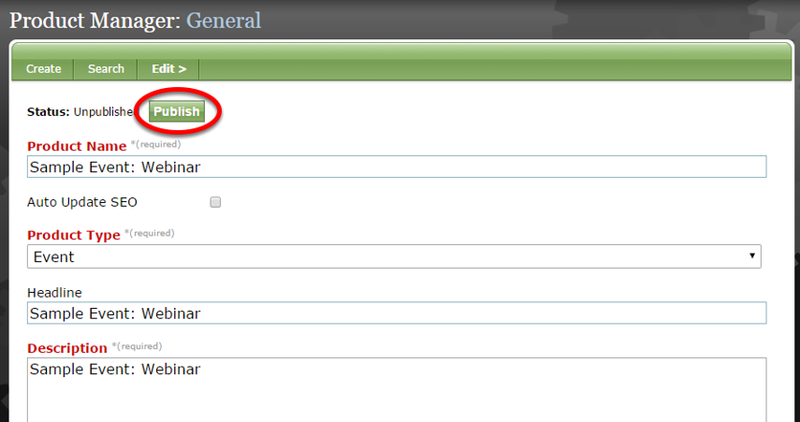 To go live, return to General under Edit and click the green Publish button. Zoom: Your event registration is ready to go. 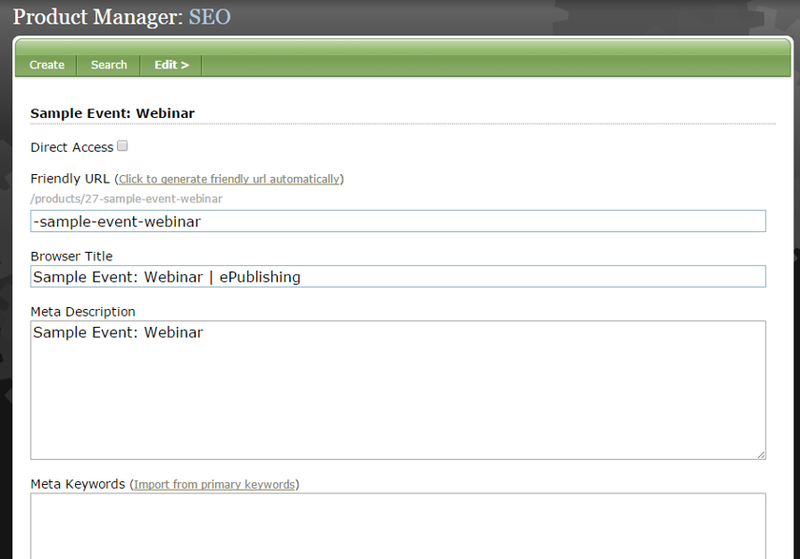 To go live, return to General under Edit and click the green Publish button. Prev: How do I create custom event details that will appear on my event microsite? Next: How do I add sponsors to an event?